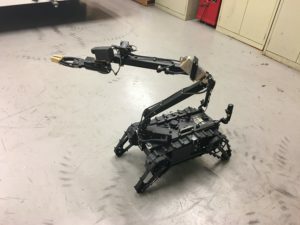 A recent delivery of three new, light-weight robots for the state’s Bomb Squad arrived just in time for the Fourth of July, often a busy time for the State Bureau of Investigation’s bomb technicians. With 64 calls since January, the members of the Bomb Squad welcome the new robots that weigh about 70 pounds, can go up and down stairs, have six cameras, can lift about 15 pounds and cut wires. They don’t need a big truck to be deployed, and they have the capability to remotely locate and neutralize Improvised Explosive Devices in confined spaces, such as aircraft, buses and trains. 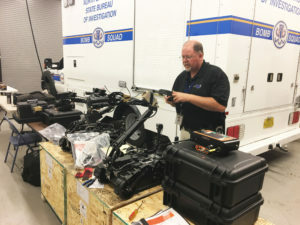 The Bomb Squad serves all 100 counties in North Carolina, and assists federal, state, local, and tribal authorities in situations involving IEDs, weapons of mass destruction, suspicious packages, homemade fireworks and other explosive hazards. The new robots will also be used to support special operations that involve violent barricaded suspects and hostage situations. In 2016 agents responded to 125 calls for service. Some of those calls were regarding explosives such as dynamite that was legally purchased at the time but stored incorrectly or was deteriorating. “Others make explosive devices for criminal reasons,” Luper said. He recalled a case in 2013 when 10 IEDS in a suitcase exploded when opened and damaged a robot, which otherwise possibly saved the life of a bomb technician. The three robots were purchased through a $153,000 grant with the Governor’s Crime Commission and delivered to the Bomb Squad on June 27.